Preheat oven to 475F. Arrange the peppers on a baking sheet and place in oven. Turn the peppers every 5 to 10 minutes so they cook evenly. Remove peppers when they have darkened, after about 30 or 35 minutes. 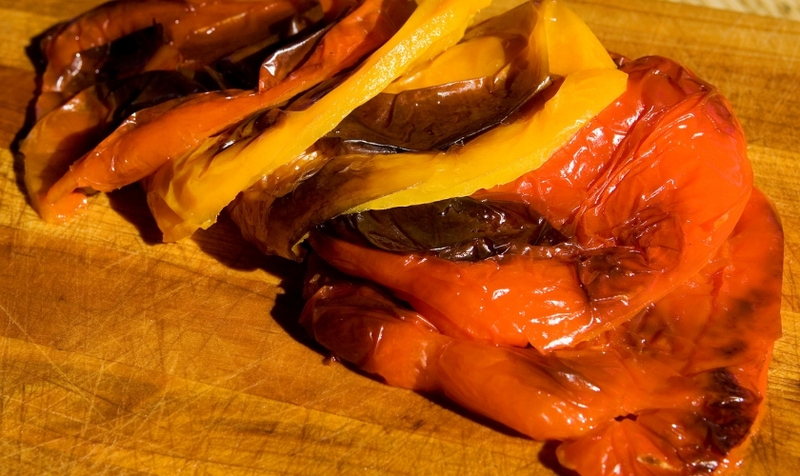 Take the peppers out of the oven and put them in a plastic or paper bag for 10 to 15 minutes so they soften and are easy to peel. This method is used a lot in Mediterranean cooking. Remove peels from peppers. Remove and discard the stem ends and seeds. Cut the peppers length-wise in 3/4 inch-wide strips. In a large mixing bowl, add the remaining ingredients and mix well. Put the peppers in the mix and turn to coat. Put pepper slices back on the baking sheet and cook for about 5 minutes. Remove from oven, and serve.